Description: Tufted perennial; stems mostly less than 2.5 cm long, rarely up to 10 cm long; leaves spatulate, upper leaves much smaller than the lower, 6-18 mm long, up to 3 mm wide, margins with short, stiff hairs; flower heads solitary at the ends of stems; involucral bracts overlapping, not all the same length; ray flowers 10-24, pale pink-lavender to nearly white, 5-9 mm long; achenes silky-hairy; pappus of two series, inner of 14-19 barbellate bristles and outer of short bristles or scales. Flowers May and June. Similar Species: The solitary heads plus double pappus of bristles and minute scales in Ionactis elegans distinguish it from sympatric species of Aster, Chaetopappa, and Erigeron. Distribution: New Mexico, Lincoln County, Sierra Blanca. Habitat: Igneous rock faces in montane coniferous forest at 2,300-2,900 m (7,600-9,500 ft). Remarks: This species is known from only a few locations on Sierra Blanca. Its nearest relatives appear to be Ionactis alpina and I. stenomeres of the northwestern United States, a very large and curious disjunction. Conservation Considerations: The forest surrounding the habitat of Sierra Blanca cliff daisy burned during the 2012 Little Bear Fire. 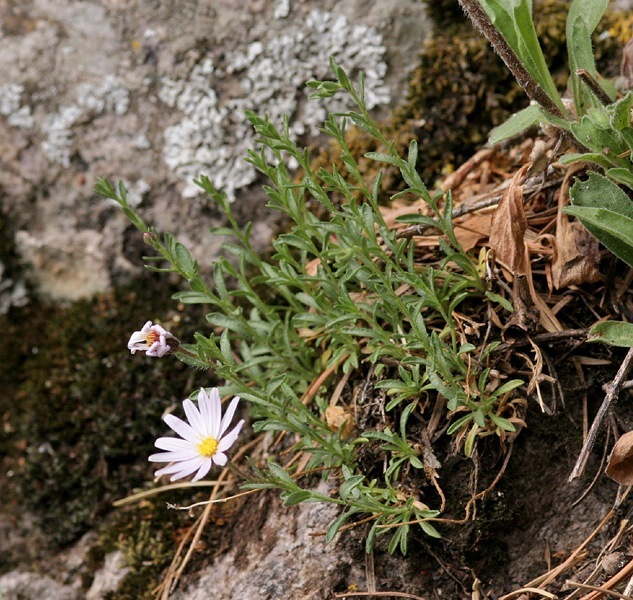 Plants survived by nature of their habitat (cliffs). Long term persistence should be monitored. Marron & Associates. 1996. An evaluation of known Ionactis elegans sites and survey for new Ionactis elegans sites within the Eagle Creek Drainage and Three Rivers Canyon areas of the Sacramento Mountains. For Lincoln National Forest, Alamogordo, New Mexico. Nesom, G.L. 1992. Transfer of Chaetopappa elegans to Ionactis (Asteraceae: Astereae) Phytologia 73(5):416-424. *New Mexcio Native Plants Protection Advisory Committee. 1984. A handbook of rare and endemic plants of New Mexico. University of New Mexico Press, Albuquerque. *Soreng, R. and R. Spellenberg. 1984. An unusual new Chaetopappa (Asteraceae: Astereae) from New Mexico. Systematic Botany 9(1):1-5. Roth, D. 2016. Wildfire Impacts on Species of Concern Plants in the Lincoln National Forest, New Mexico. Unpublished report prepared by EMNRD-Forestry Division, Santa Fe, NM for the U.S. Fish & Wildlife Service, Region 2, Albuquerque, NM. 28 pp.